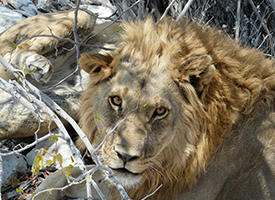 Etosha NP is of Southern Africa’s finest and most important Game Reserves. It was declared a National Park in 1907 and covering an area of 22 270 square km, it is home to 114 mammal species, 340 bird species, 110 reptile species, 16 amphibian species and, surprisingly, one species of fish. 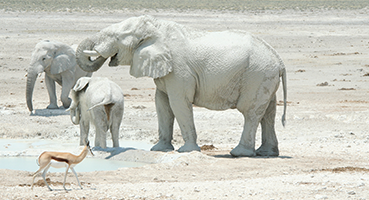 Etosha, meaning “Great White Place”, is dominated by a massive mineral pan. The pan is part of the Kalahari Basin, the floor of which was formed around 1000 million years ago. The Etosha Pan covers around 25% of the National Park. 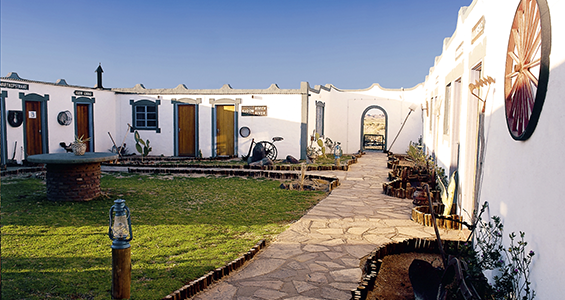 The pan was originally a lake fed by the Kunene River. However the course of the river changed thousands of years ago and the lake dried up. The pan now is a large dusty depression of salt and dusty clay which fills only if the rains are heavy and even then only holds water for a short time. This temporary water in the Etosha Pan attracts thousands of wading birds including impressive flocks of flamingos. 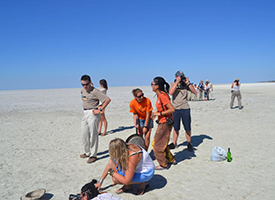 The perennial springs along the edges of the Etosha Pan draw large concentrations of wildlife and birds. A San legend about the formation of the Etosha Pan tells of how a village was raided and everyone but the women slaughtered. One woman was so upset about the death of her family she cried until her tears formed a massive lake. When the lake dried up nothing was left apart from a huge white pan. The game viewing in Etosha National Park is excellent, the best time being from May to September – the cooler months in Namibia. 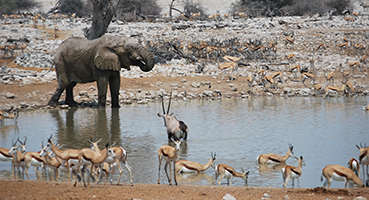 Visitors to Etosha Game Reserve can expect to see many buck species, elephant, giraffe, rhino and lions. More fortunate visitors will see leopard and cheetah. Camping is inside one of 3 permanent campsites with facilities of swimming pool, bar, shop and restaurant. 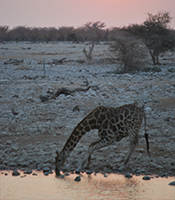 All campsite waterholes are floodlit allowing for excellent night time game viewing. 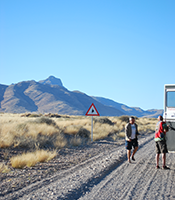 Daily game drives are done in our truck throughout the park.